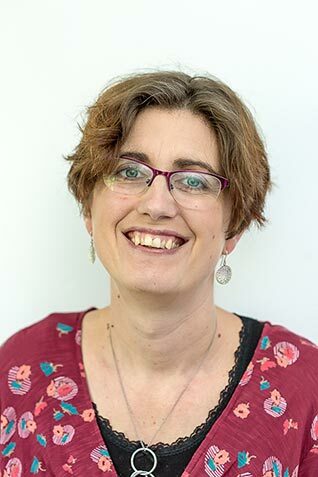 I have been wondering for some time why my pins no longer felt sharp… and eventually my mind came round to the fact if my scissors become blunt so will my pins and needles!! So I have been on a research mission, to my delight I have discovered emery for pincushions. I had never heard of it before. It is a little like sandpaper but as sand, a fine powder. Inevitably I had to try it out, and whilst I was at it make a super cute emery pincushion. Naturally I turned to my scrap box and decided to have a go at some random quilting. Cut out random shapes, I used three fabrics cutting out four pieces from each. 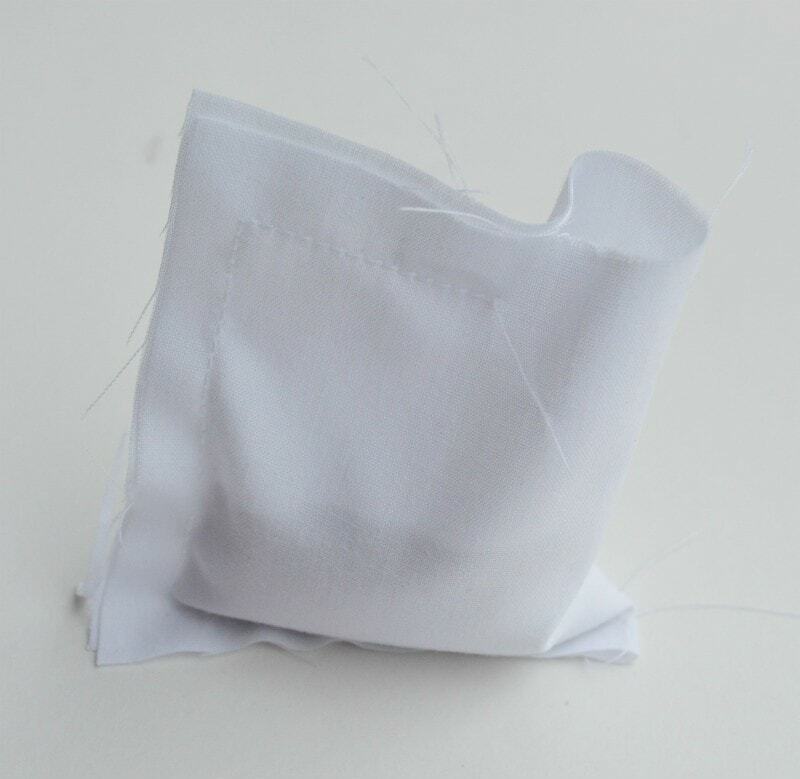 Sew two pieces of fabric together, and then press. Sew on your third fabric. Create four applique squares measuring 1 1/2″. 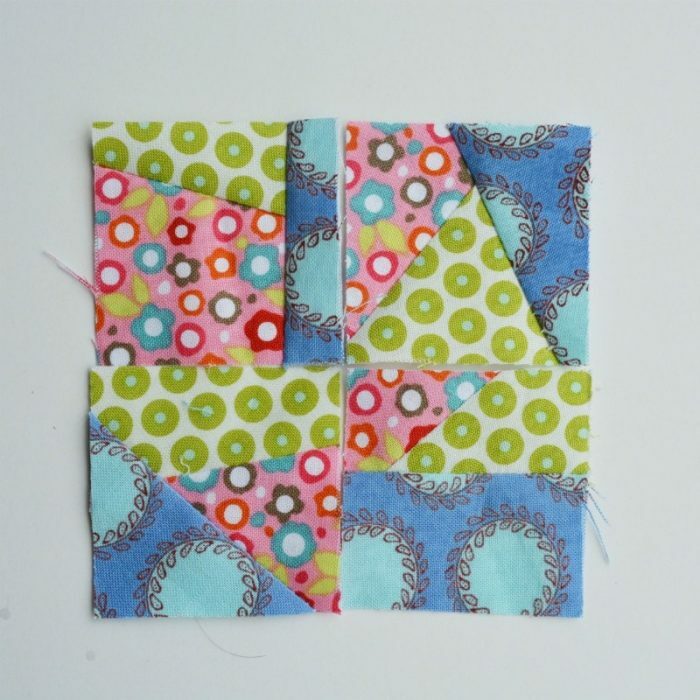 Sew your squares together to make one larger square. 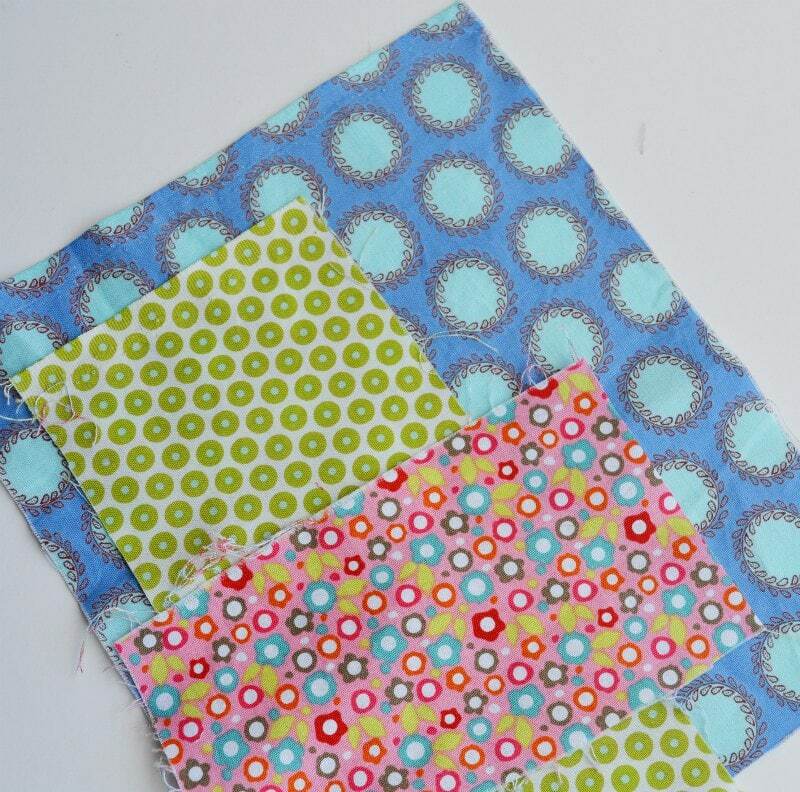 Cut out the base of your pin cushion 2 1/2″ square. Place right sides together, stitch three sides together. Turn right side out and press seam allowance in on the open edge. 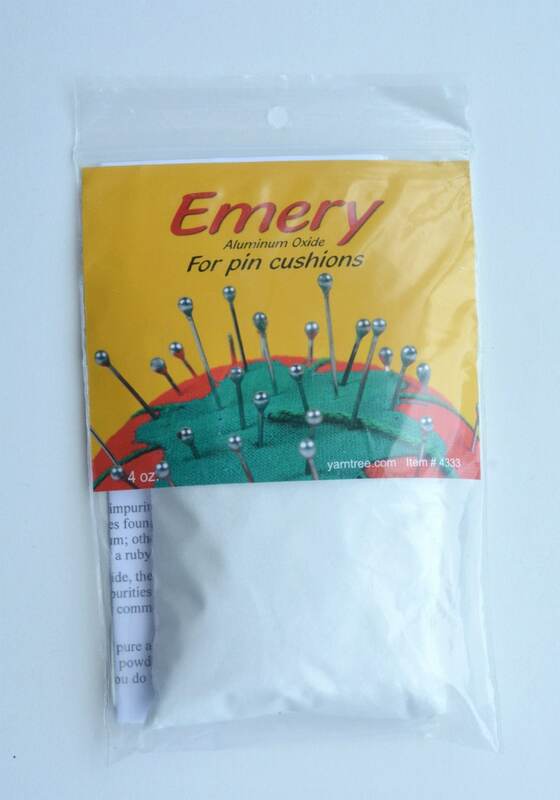 Next create a sack of emery to place inside the pin cushion at the top. 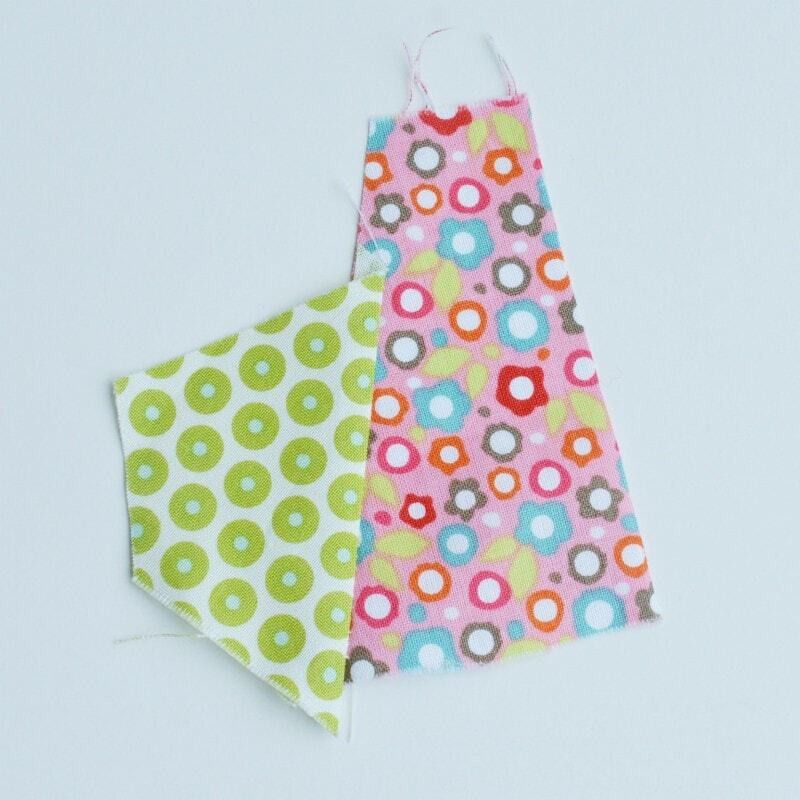 Cut out two pieces of fabric 2 1/4″, sew four sides together leaving a small opening to add your emery. Fill with emery. Hand stitch this seam up. Zig zag your seam allowances. 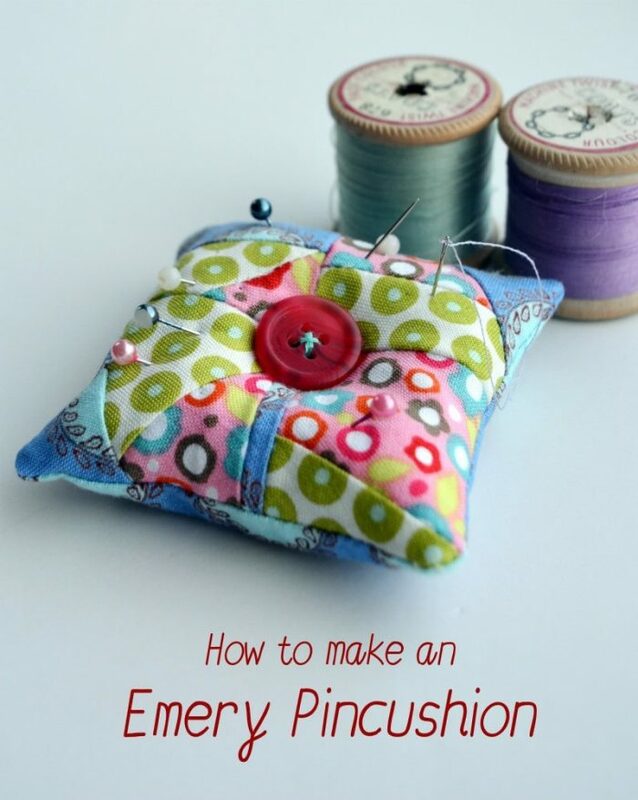 Insert your emery sack into the pin cushion. Fill up underneath with some polyester filler. Finally hand stitch up your open seam, and add a button on the centre of the top of the pin cushion. I’m looking forward to sharp pins!! 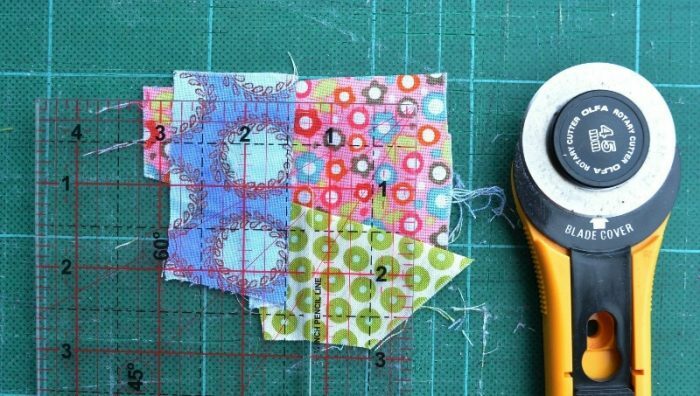 Fancy more scrap fabric projects? check out my pinterest board for further ideas, especially if you are like me you cannot stand sending fabric to landfill. Would love to know how to sharpen your scissors? I’ve tested three different methods for So Sew Easy here. "Make a DIY fabric pinboard #MyHomeMade #Giveaway"
Must admit I seem to be collecting a few pincushions!! It’s a really sweet little pin cushion, I didn’t know that you could have something to sharpen your pins and needles. Hi thanks for the tip,i have a piece of steel wool in my pin cushion to sharpen my pins and needles. and they stay sharp all the time never a blunt pin or needle. Where can u get the emery? Hi! I bought one of the last few buckets of Emery 400 grit from a US importer with the last remaining supply to make pincushions a few years back. The grit must be very fine, a grit of 400 or higher number to actually sharpen pins and needles. I did a lot of investigation on the subject back then. Most people selling pincushions on Etsy, when I asked what size grit they were using, responded, “65” and seemed unaware that such coarse grit serves only to dull, not sharpen needles or pins. The reason they were getting the 65 grit was probably because emery could no longer be imported and the roughest grade is all we have here anymore, plus it was the least expensive. True black emery is the original grit used for centuries, and in more modern times, for really good waterproof sandpaper and comes ONLY from Turkey. The British invaded Turkey at some point way back and controlled the emery trade for years. In recent years, Turkey forces seized the mines and will no longer sell to the USA (not sure about Europe). The substitute quality grit used now for good sand paper is made from silicon carbide. Many people are most familiar with the low quality (reddish brown) corundum which cracks and deteriorates quickly. Do you remember your mom or grandma having a red tomato pincushion with an attached strawberry? That strawberry was filed with emery. I never knew that when I had one and wish I had not discarded it. Nakpunar.com located in NJ, USA and we carry Turkish Emery Sand as well as ready to use pincushions. The best size for the emery pincushion grit is between 80-100. The reason for that it’s thin enough to not dull the very tip of the needle and not too thin to leak from pinholes. We always recommend using extra inner cover made with tight weave fabric like not see through muslin fabric. Thanks for the tutorial. I put it in my Pinterest folder for my followers and as a reminder to get busy making pincushions!